Big residential projects are being scheduled and in the process of construction around Fenway this year, bringing luxury, style and great new additions to the popular area. 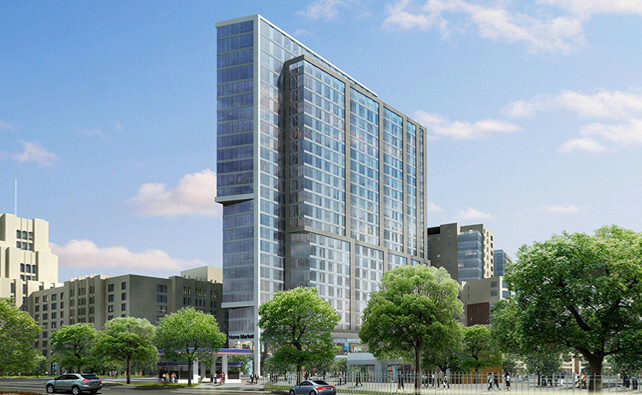 The first big tower that has already begun construction is the soon to be iconic Pierce Boston. The $175 million mixed-use luxury building is being constructed at the intersection of Boylston Street and Brookline Avenue. The 30-story luxury building will feature 109 luxury condos, 240 rentals and ground floor retail space. Hoping to add contemporary sophistication to the area, Pierce Boston will provide residents with units ranging from studios to three bedrooms. More than just adding more residential space to Fenway, the building will provide a currently non-existent pedestrian connection to Fenway Park, Landmark Center, the Emerald Necklace and Longwood Medical Area. This connection plans to help revitalize the area and become a central destination for residents and visitors. Although not as far along in the development process as Pierce, proposals for 2 Charlesgate West would also have a significant impact on the Fenway area. The 300-unit tower would be located just south of the turnpike and would improve the gateway into the Fenway neighborhood. It would be created alongside improvements to the nearby public space as well. Trans National, the developer behind the proposed project, have yet to file finalized plans for the project, but have referenced it and already own the current space at 2 Charlesgate West. The project would cost an estimated $250,000,000 and would be another welcome development to all of the reshaping occuring in this area. These developments follow in the footsteps of the 172-unit Van Ness which opened last summer, offering residents units ranging from studios to two-bedrooms.